Platform Size 2.9" x 2.7"
Scale Size 4.7" x 3.1" x 0.8"
Bright Backlit Display This digital scale has a fancy red, backlit display to help ya see your weight readings, even in dim lighting. Easy Calibration This jewelry scale comes factory calibrated and ready to use. Just in case ya need to calibrate it, the MX-500 comes with easy to follow calibration instructions. You'll just need to pick up a 200 gram calibration weight to get the job done. Man, This Thing Is Tiny You won't have to worry about this scale taking up space. It's just under five inches long, and less than an inch thick! You can take this scale pretty much anywhere ya want...stick it in a pack, purse, or in your shirt pocket. It Remembers The Last Unit Ya Used If your application needs weights in the same unit of measurement, (like ounces for instance), it can be a real pain if your scale always turns on ready to weigh in grams. It's a good thing the MX500 turns on displaying the unit of measurement you were using when ya turned it off. Auto-Off Feature If ya have ever had the batteries in something run out because you forgot to turn it off, you'll realize what a blessing this feature is. The MX-500 will automatically turn off after a few moments of inactivity, saving battery power and money. The scale I purchased is perfect for what I needed. Shopping and checkout were easy. Shipping was fast. The scale is simple to use and easy to understand. The price is affordable compared to what you are getting. What I got is perfect for me, but if I ever need to upgrade, I will shop Old Will Knotts again. This scale is perfect size for home use and works great. Very satisfied with purchase and entire experience with this seller. 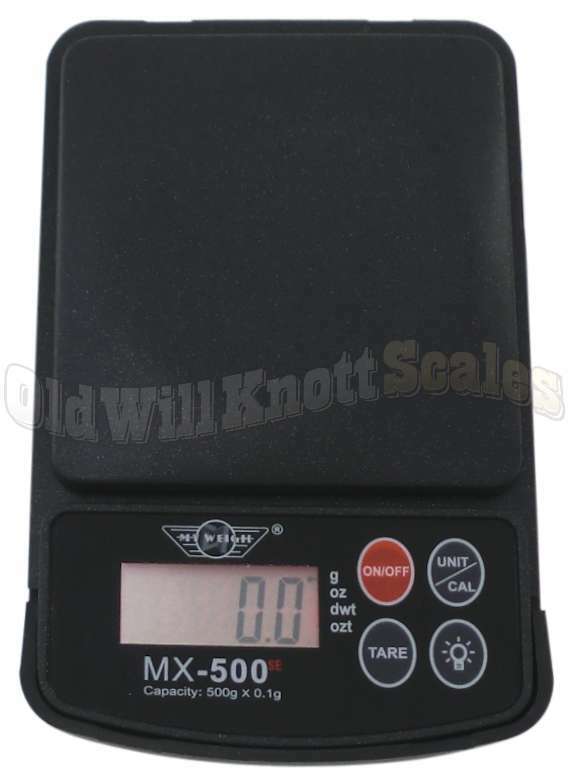 This nice little scale was purchased to replace an old Mx-200 that had finally died. Well, actually, it still worked, but someone accidentally cleaned the screen with a chemical that caused it to become cloudy and unreadable. These scales work as well or better, and we expect that they will last just as long. We always get great service and quick shipping from OldWill. Use these scales in the field so they get jostled around. Didn't think they would hold up but they do. I take care of them like any scale but they are subjected to being carried a lot. They are such a resonable price. I order several each year for the various people I work with. I HIGHLY RECOMMEND THEM. And... can't beat the customer service. Very helpful. A pleasure to do business with. 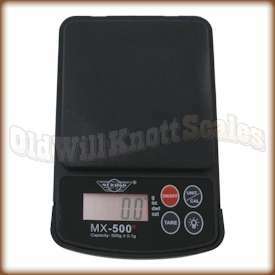 We've used several MX500 scales through the years for a chain of stores I work for, and we've found them to be the most reliable little scales we've ever used, and we've tried a lot of them out there. They are so easy to operate, too! Any time we test them, they're spot on, and they seem to last forever (except when we drop one, as happens on occasion). We couldn't be happier with this scale. Highly recommend! Not very impressed with this scale. Buttons require pushing hard, reading jumps around when it's empty.